I don’t know if I have mentioned it before, but we have got some picky eaters over here. We’ve tried every trick in the book, read every article in every parenting magazine, and even conferred with the pediatrician. The conclusion has been to give it time, but in the mean time, how do I get any veggies into those bodies? That is one beautiful loaf. 1 Place the freshly grated zucchini in a sieve over a bowl to catch any excess moisture as it drains, while you work on prepping the other ingredients and preparing the recipe. 2 Preheat oven to 350°F, with a rack in the middle. Grease two 9×5-inch loaf pans with baking spray or butter. 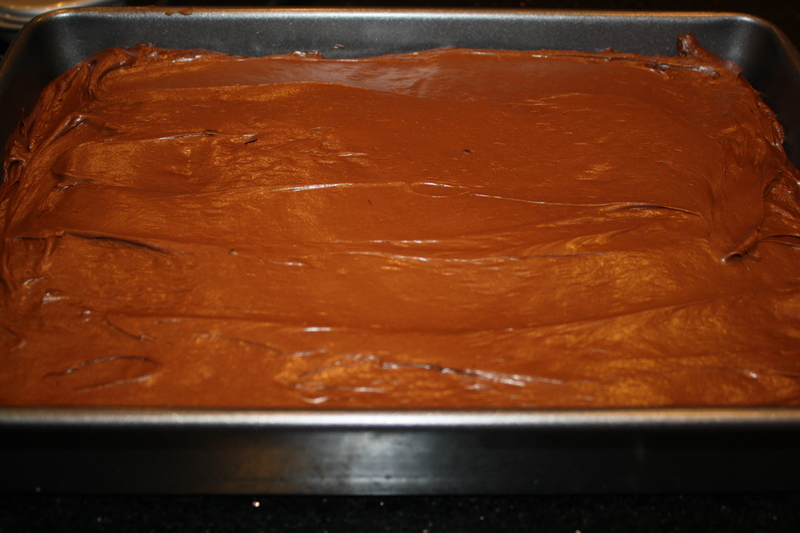 3 Vigorously whisk together the flour, unsweetened cocoa, baking soda, salt, and cinnamon in a large bowl. Whisk until there are no more clumps and the ingredients are well combined. 4 In a separate large bowl, beat together the sugar and eggs until smooth, about a minute. You can do this with an electric mixer on medium speed, or by hand with a wooden spoon. (I’m lazy and use a mixer but it’s easy enough to do by hand.) Add the melted butter, instant coffee granules, and almond extract and beat until smooth. 5 Mix the shredded zucchini into the sugar egg mixture. 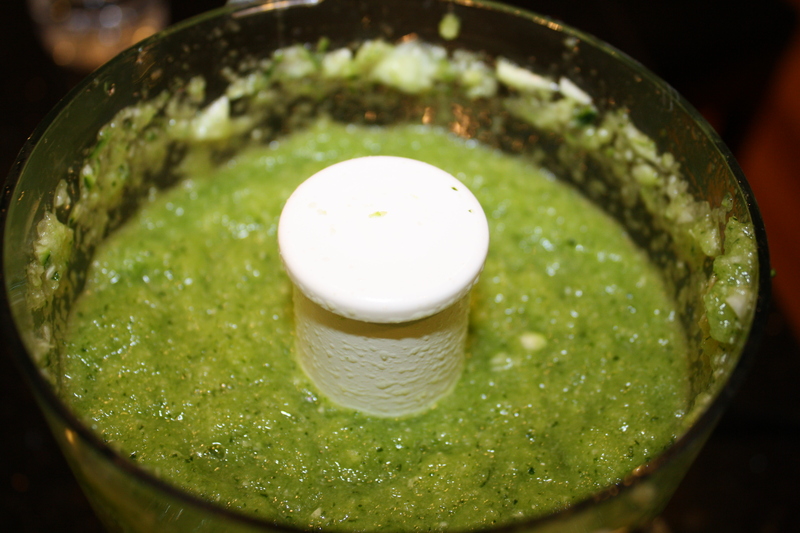 Add the flour to the zucchini mixture in 3 additions, stirring to combine after each addition. 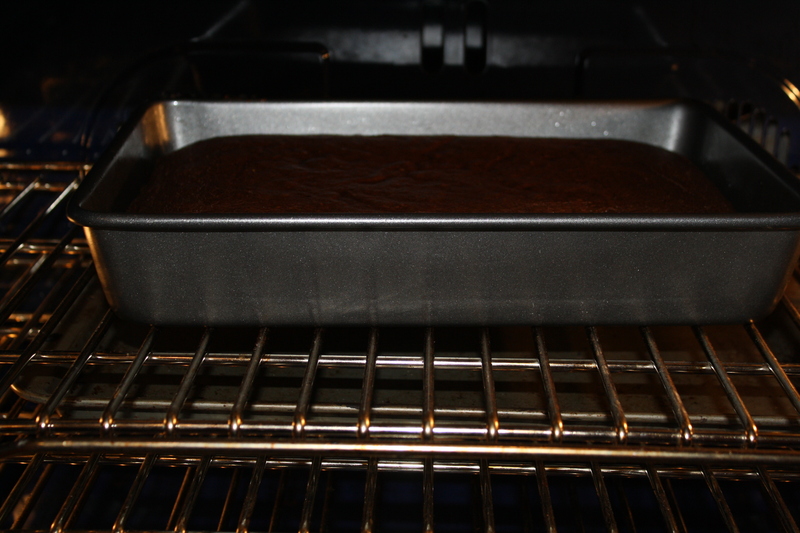 6 Work quickly, and divide the batter between the two prepared loaf pans. 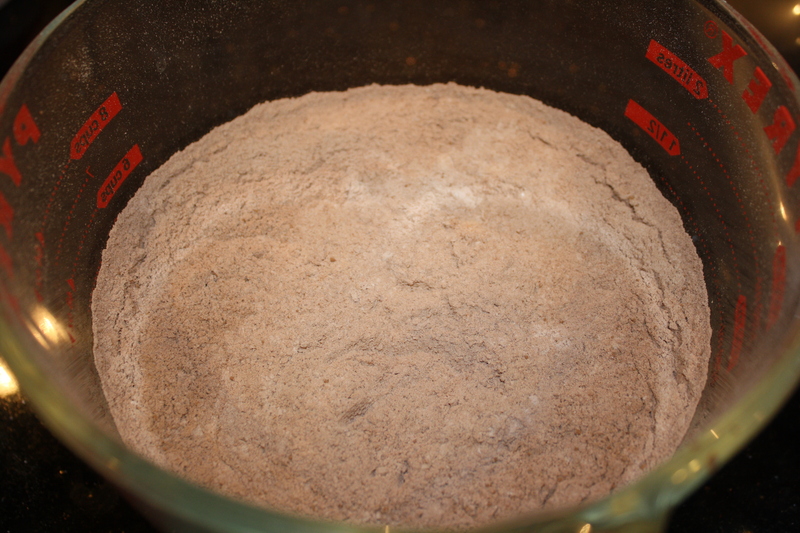 (Work quickly because once the dry ingredients have mixed with the wet ingredients, the leavening has begun.) Place into the oven. Bake for 50 minutes at 350°F, or until a skewer inserted into the center comes out clean and easily. Remove to a rack. Let cool in the pan for 5 minutes, then run a blunt knife around the edges to separate the bread from the pan. 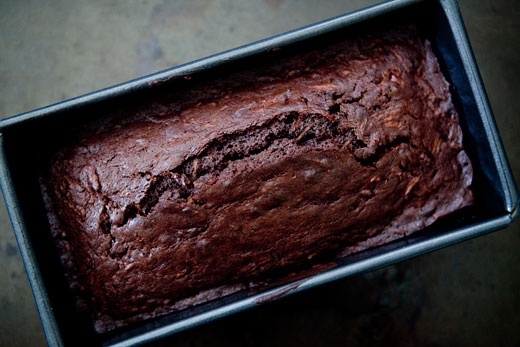 Remove from the loaf pans and let cool completely on a rack. Which is all fine and dandy, but I decided to take it one step further and make chocolate cake, with a few other modifications as well. Then, I combined all of the dry ingredients in a bowl and whisked according to the directions. You could also sift this or put it through a wire strainer to get all the lumps out. I left out the instant coffee granules because I didn’t need the caffeinated noise, and also because I don’t keep instant coffee in the house. 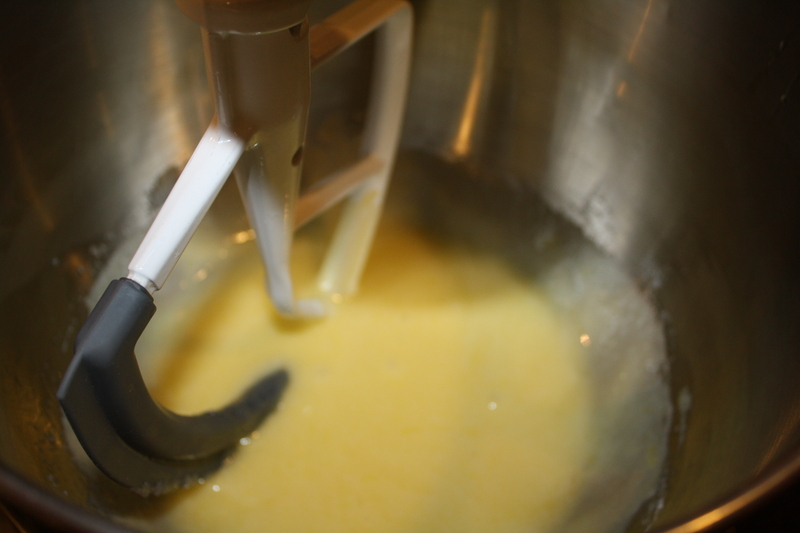 Then I combined the eggs, butter and sugar in the mixing bowl. And readied the zucchini in my food processor. While the original blogger shredded hers, I needed smaller pieces that would be nearly undetectable, so I pureed mine. 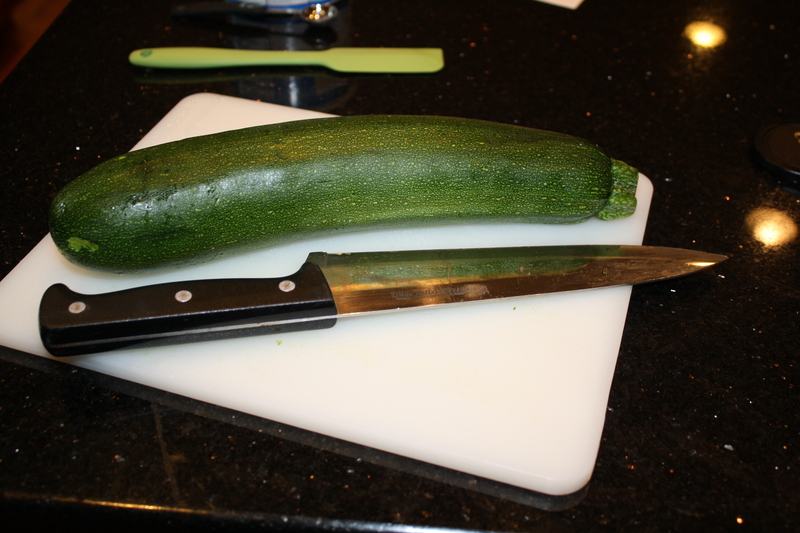 The original blogger also strained her zucchini to remove excess moisture, but I couldn’t do that with the puree. 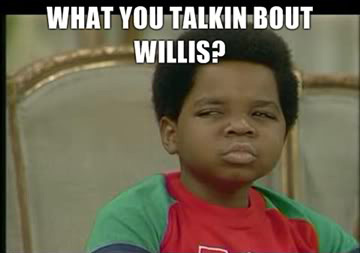 I did not find that there were any adverse effects because of that though. 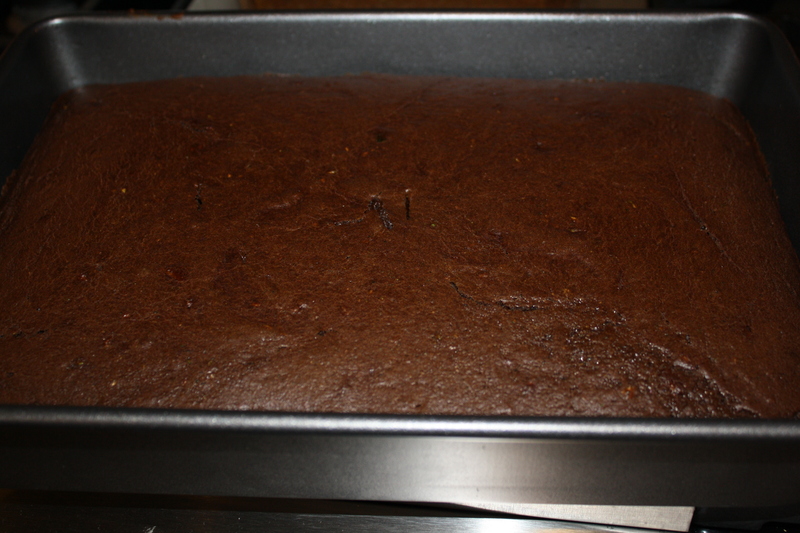 The final product actually came out very rich and moist. Next, I added the almond extract, plus a teaspoon of vanilla. 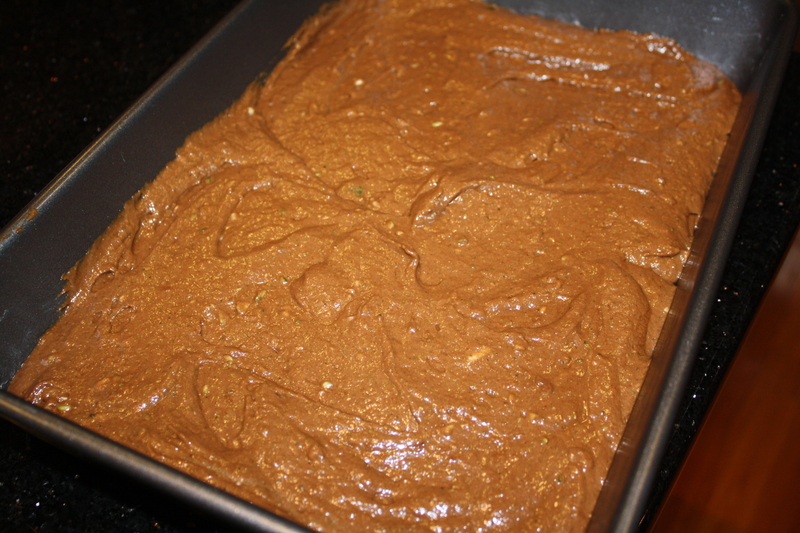 Then the dry ingredients were added in 1/3 portions, and once everything was combined, the batter was poured into a 9″x13″ pan. 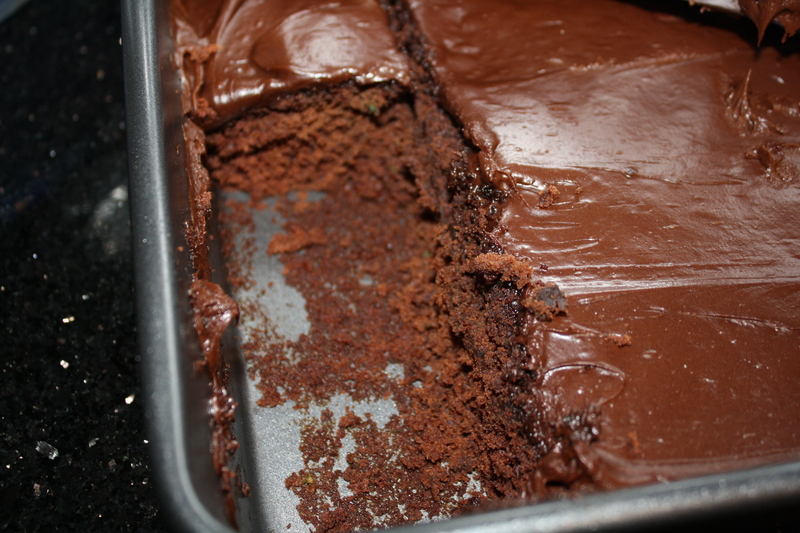 Then I baked it for 30 minutes at 350 degrees until a knife inserted in the center of the cake came out clean. And then I iced the cake with some canned frosting. I know, the horror, but they loved it — and more importantly, they ate it. If you make your own icing, it would certainly work with that. I used chocolate, but if I had been making it for myself, I might have gone with cream cheese icing. They have no idea that I am slipping them anything laced with vitamins and nutrients. It tastes just like chocolate cake!